In a large bowl or stand mixer, beat the butter until light and fluffy. Add the flour and beat well. In another medium bowl, stir the yeast into the sour cream. Beat in the eggs, salt, and vanilla. Beat the sour cream mixture into the flour mixture until combined. The dough will be very sticky. Cover the bowl and let chill in the fridge for 2 hours or overnight. It's easier to manage the dough when it's cold, and it gives the yeast a chance to develop. Preheat your oven to 350 degrees F. Line a few baking sheets with silpats or parchment paper. Sprinkle a generous handful of the 1 and 1/4 cups sugar onto a work surface. I used a pastry cloth, or a silpat would work well too. If you roll out on the countertop you will need quite a bit of sugar since the dough is so sticky. Scrape the dough on top of the sugar, sprinkle some more on top, and use your hands to pat it down. Roll it into a rectangle with a rolling pin. Sprinkle the rolled dough with more sugar. Don't be stingy! Use a lot so that it doesn't stick, you may need more than the 1 and 1/4 cup called for. Fold the dough in half, sprinkle the top with sugar, and roll out into another rectangle. Repeat this sugaring, folding, and rolling, process 3-4 times, until the sugar is gone. The final time you roll the dough in a rectangle, sprinkle with sugar, then fold the dough in thirds like a business envelope (add sugar in between layers). Roll into a long strip, about 4-5 inches by 22-24 inches. See photos. Use a pizza cutter to slice the dough into strips about 1/2 inch wide. (Each strip should be about 1/2 inch by 4-5 inches). 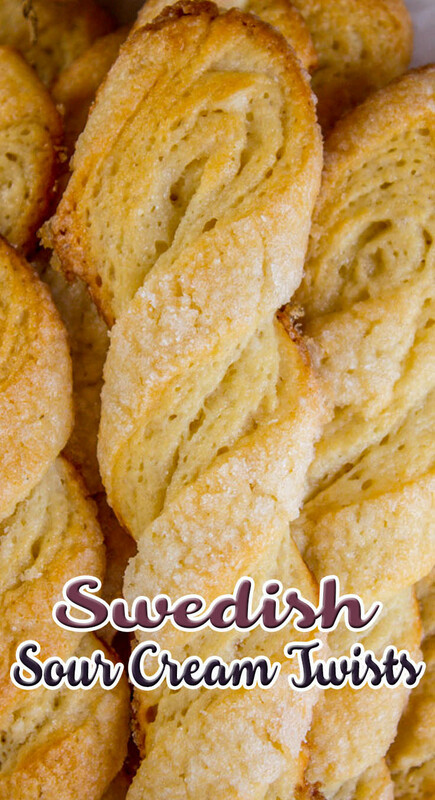 Use your fingers to twist each strip, then roll generously in 1/2 cup sugar. Place on the prepared baking sheets spaced about 2 inches apart. Repeat with the remaining strips of dough. Bake at 350 for about 17-20 minutes or until lightly browned on the edges. If you think you will like them extra crispy for coffee-dipping, leave them in a couple minutes longer. The recipe makes 36-40 twists, depending on how you long you made the twists. Serve with hot chocolate! It's so good! !